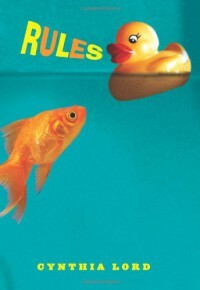 Rules is an excellent book and is told with similarities to other books such as Wonder and Fault within Our Stars. Rules is intended for a younger audience. While I think the topic may be too mature for the recommend starting audience of third grade, at least the content isn’t at all sexually or violently graphic. Nor will you find any curse words, including the recently allowable “damn” or “piss”. As a male and as a father to a little girl, I felt some awkwardness during the few pre-teen girl conversations, but there was nothing that would make anyone blush. It took me a little while to get accustomed to the young narrative voice, especially because the story was told in the present tense. This isn’t a fault, it just took me a while to pace myself to. The story itself alternates between home life and the life in the waiting room of a clinic, ending in a climactic scene set outside both environments. As did the books I mentioned earlier, Wonder and Fault in Out Stars, the story brings to light an important social issue. In Rules, we are introduced to a female protagonist coming of age whilst living with an autistic brother. At home, a significant amount of family resources are used to support her brother instead of her. Elsewhere, she’s trying to find her place in the world while determining how much of a presence her brother should have in her public image. The author cleverly adds in another element of a disabled boy whom the protagonist befriends. Unlike Wonder, the charm of Rules comes from the end of the book. There are no real heartbreaks or moments that make you want to get emotionally involved until the closing scenes. But the book is a quick read and well worth the journey to get to those final moments. In those final moments, you will want to cheer. More importantly, you will be glad that you took the time to let Catherine and her brother into your life.